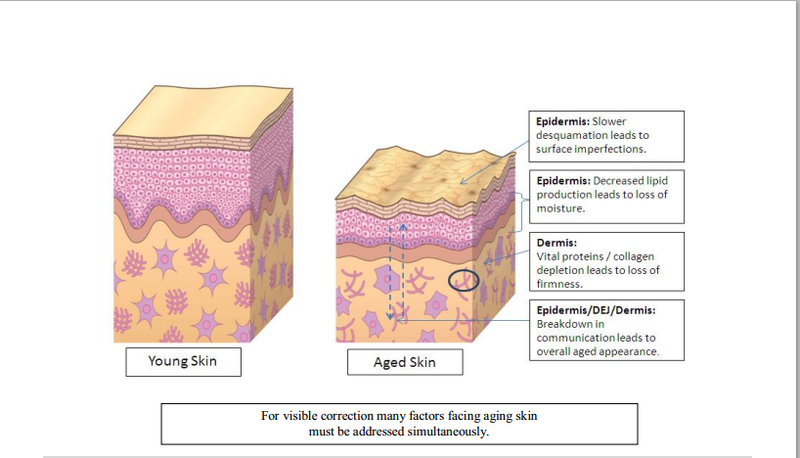 Kiehl‘s chemists took this same ‗complete‘ approach in their battle against the signs of aging skin. Instead of focusing on the individual concerns related to aging skin, Kiehl‘s took a multi-functional approach by targeting multiple key signs of aging. With Kiehl‘s cutting edge formula and proprietary tri-active technology, Kiehl’s Super Multi-Corrective Cream is clinically demonstrated tosimultaneously lift, firm, visibly redefine skin contours and re-texturize skin within 2 weekswith double efficacy shown within 4 weeks. For visibly younger looking skin, multiple signs of aging need to be addressed simultaneously. Did you know that younger skin and aged skin behave quite differently? When damaged, young skin takes only 6 hours to recover and repair itself. Alternatively, aged skin takes over 30 hours. As we age, our cells also age and become less resilient to internal and environmental aggressors. The result is loss of elasticity, wrinkles and rough texture. “As aging skin repairs itself more slowly than younger skin, Kiehl‟s chemists opted to address multiple signs of aging simultaneously in order to provide the most efficient results,” shares Cammie Cannella, Vice President of Education. contours, firmness, texture, elasticity and wrinkles. Kiehl‘s chemists focused on three ingredients that until now have never been combined in a cream: Jasmonic Acid: A highly effective yet very mild, active known for its ability to support epidermal renewal and help to visibly correct wrinkles, fine lines, loss of suppleness and elasticity, while gently smoothing and retexturizing the skin‘s surface. signal molecule, Jasmonic Acid, that triggers and regulates a plant responses to these external stressors. the production of glycosaminoglycans (GAGs)2 Fragmented Hyaluronic Acid: Known to reinforce skin‘s natural short and long term moisturization. Additionally, it is known to improve skin elasticity while reducing skin roughness and reducing the appearance of wrinkles. “When looking to develop an advanced anti-aging cream, we had to identify which ideal ingredients, that when combined, could swiftly and effectively improve multiple concerns on visible signs of aging skin. The result of this research was Kiehl‟s Tri-active Technology of Jasmonic Acid, Beech Tree Extract and Hyaluronic Acid,” shares Dr. Geoff Genesky, Head of Kiehl’s Skin Care Laboratory, Research and Innovation Manager.  To ensure the delivery system of the three anti-aging ingredients could additionally offer nourishing, antiaging hydration benefits - a key factor in improving skin barrier and skin texture.  To act as a ―harder working, multi-tasking‖ anti-aging solution, one that easily fits into a busy woman‘s daily routine. Challenge #1: Incorporate Jasmonic Acid into a cream base without destabilizing the emulsion Jasmonic Acid is at the core of Kiehl‘s tri-active technology. The salt form of the Jasmonic Acid was chosen due to its proven efficacy offering gentle retexturizing benefits to the skin, without irritation. Until now, this salt version of Jasmonic Acid has typically been used in serums as the ingredient is easier to stabalize in a serum base. In a cream base, building viscosity3 is challenging due to high concentration of electrolytes in this form of Jasmonic Acid. The concentration of electrolytes can easily disrupt most emulsifiers in an oil-in-water emulsion resulting in the combination separating. This challenge was overcome by Kiehl‘s chemists selecting and fine tuning the level of specific, robust emulsifiers to ensure the integrity of the formulation. This technical achievement enabled our customers to have an anti-aging cream that offers the known efficacy of a serum. Challenge #2: Ensuring an elegant texture of the product on the skin. Stabalizing the formula is not the only challenge with utilizingthe highly effective ingredientJasmonic Acid. This ingredient adds an additional complexity. During formulation, it can disrupt the formula‘s texture, making it less spreadable. Kiehl‘s chemists needed to deliver a stable and effective formula that also provided a soft, aesthetic touch. To achieve this, they formulated with the nourishing emollient Shea Butter to provide a hydrated, silky texture on the skin. Challenge #3: Incorporate Beech Tree Extract at a potent level + hydration without ―stickiness‖. , Kiehl‘s chemists had to carefully select ideal emollients to balance this ―uber sticky‖ formula. Super Multi-Corrective Cream‘s specialblend of emollients were chosen for their ability to impart a light, dryer feel with others selected for their ability to impart a richer feel. Super efficacy, clinically proven5 results within 2 weeks. 3Measure of the ―thickness‖ of a fluid. For example honey has a higher viscosity than water. 4 Emollients come in varying structures, solubility and molecular weights. 5 4 weekclinical test: 117 women, multi-ethnic (Asian, Caucasian, Hispanic and African American) subjects experiencing multiple signs of aging. It sounds really good but does it work is the question? I know their products are highly rated, xoxo.